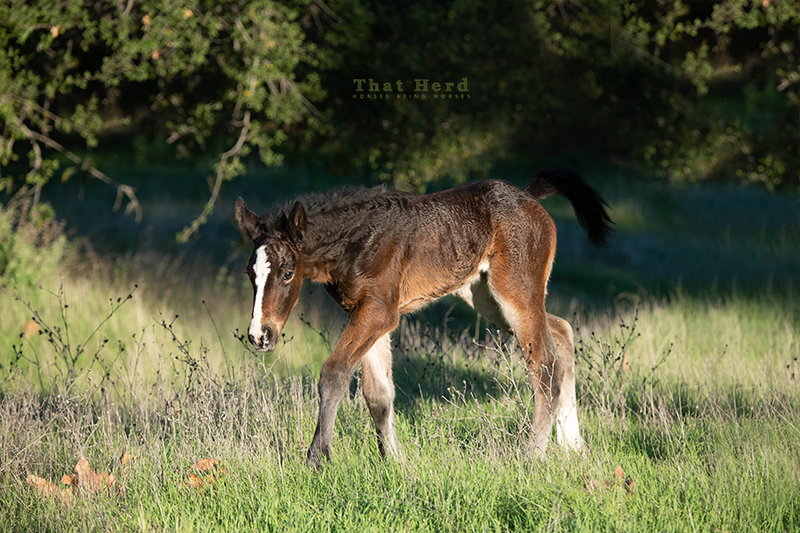 A strong colt makes his appearance as the first foal of 2019. 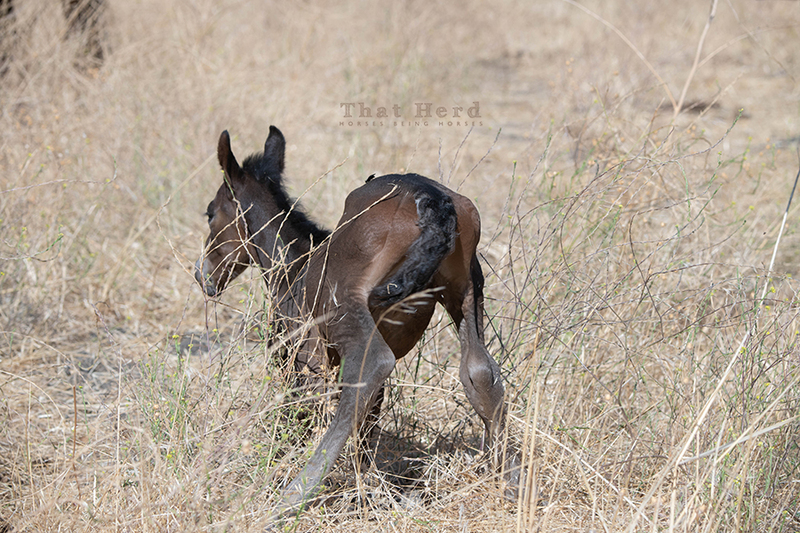 The new year has brought us a new That Herd member. 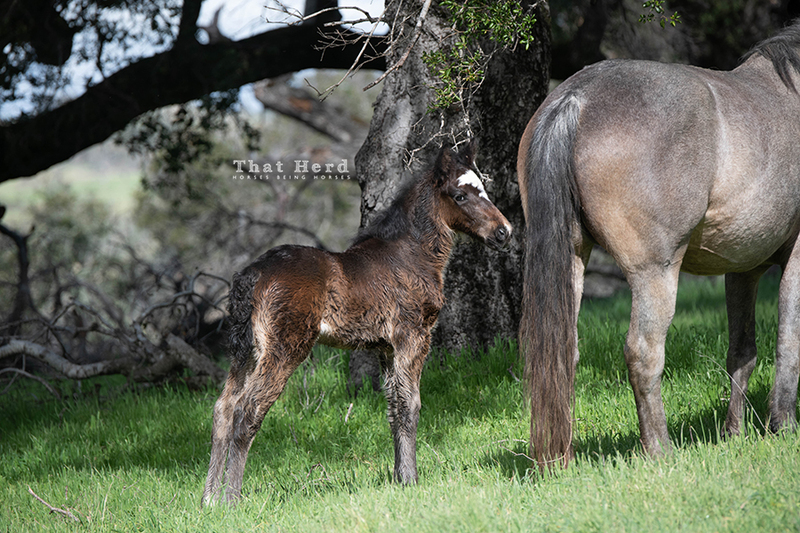 Strong and flashy, this colt earns the distinction of the first foal of 2019. 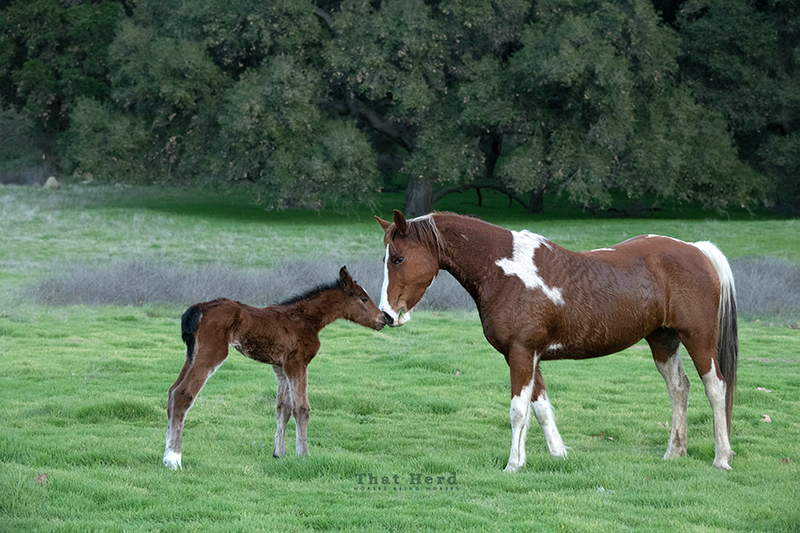 Be still my beating heart; the foals are coming! I post different images across various social media. 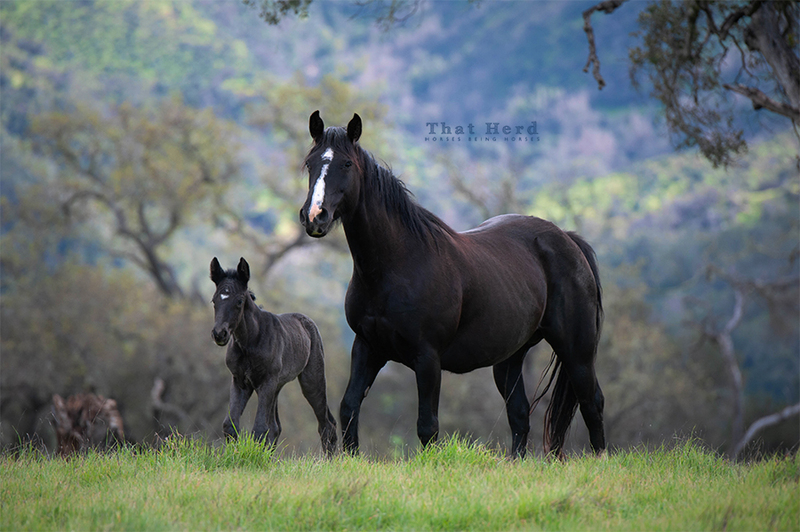 I rarely put the same image on other galleries, so take a look around. 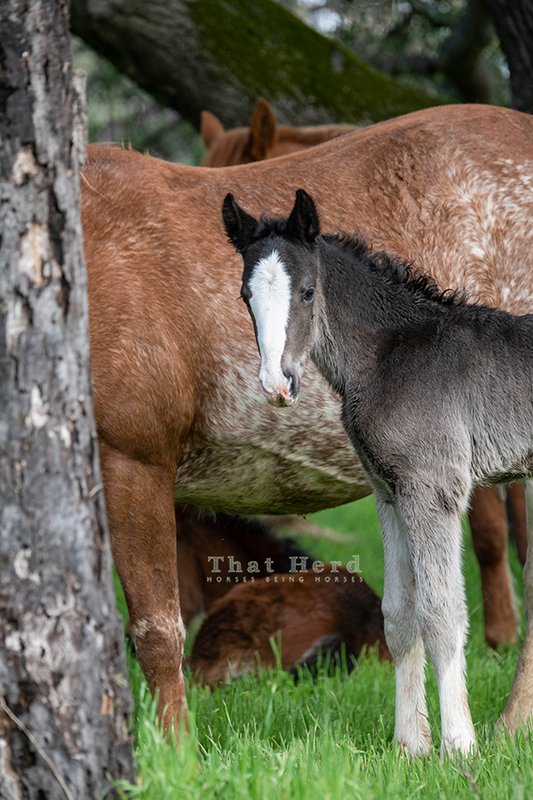 Normally, all the foals are born by the end of June, but this year a late birth has brought new life to That Herd. 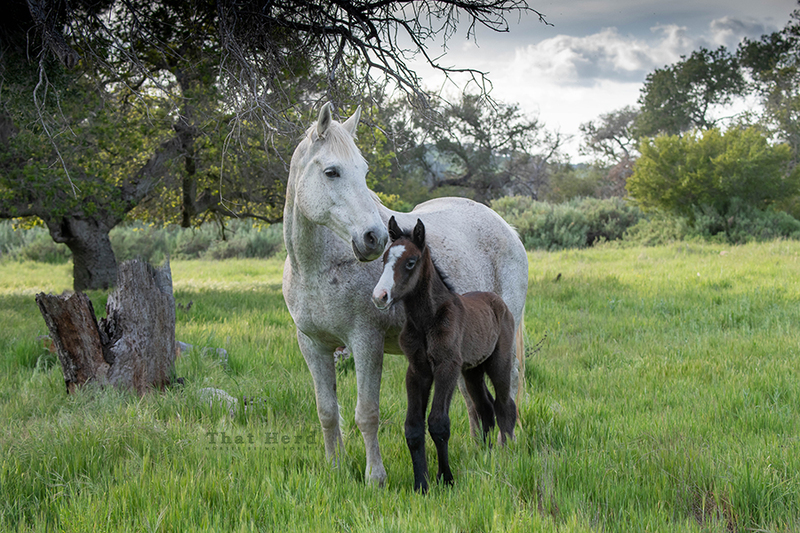 Within several hours of his birth he faced many confusing situations. Some of the challenges he faced were hard to watch. 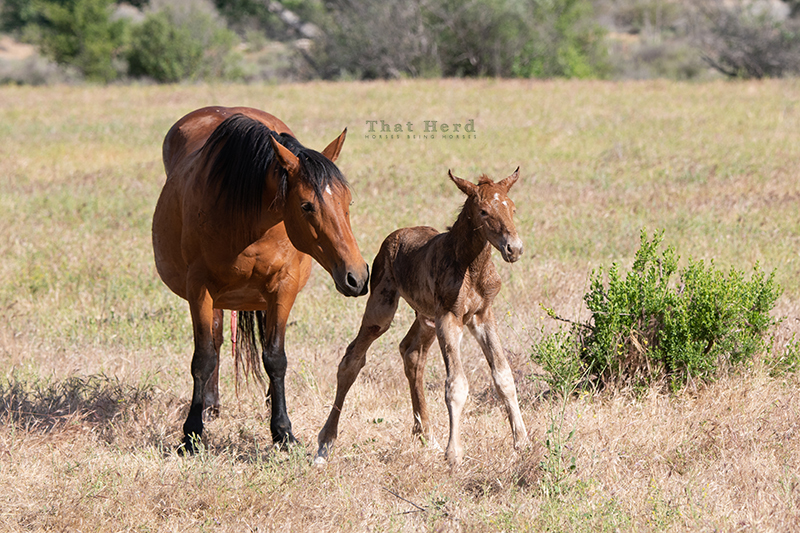 Dealing with heat, and dust, and very dry surroundings, was already a lot, but he also became the easy mark for horse flies. 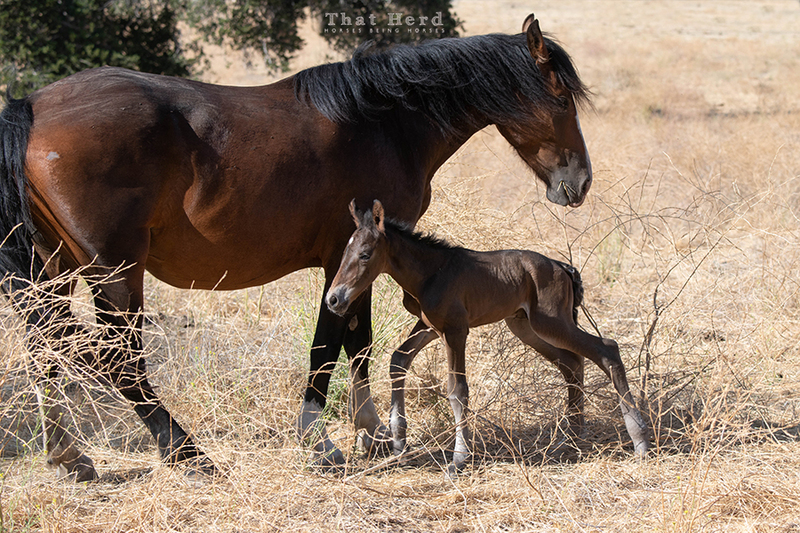 Because of his lack of life experience, the absence of a long tail, and thick skin, he endured several bites. 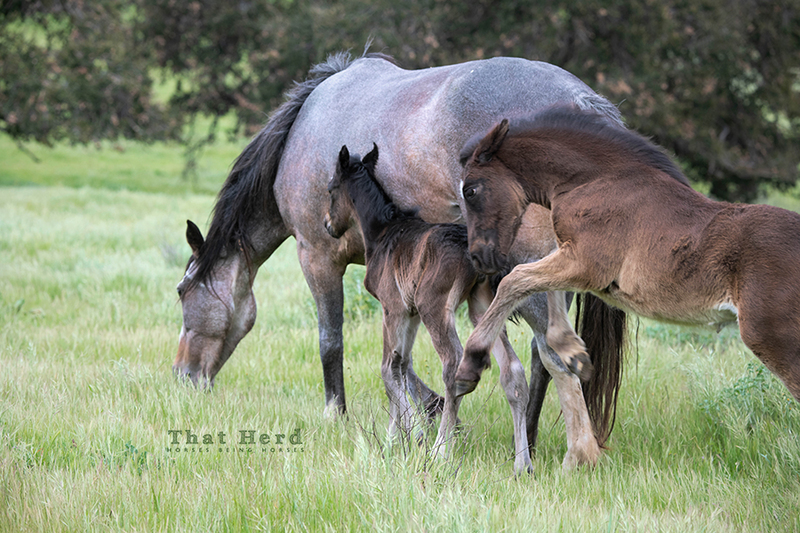 The grown horses in the group were also tormented by the blood-sucking flies and retreated to the branches of on old oak tree to scrape off the flies that they couldn’t knock off. 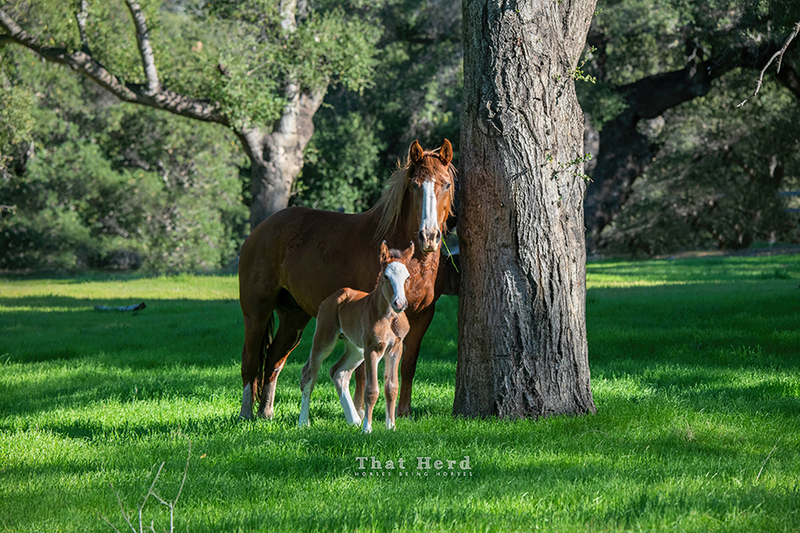 While under the tree, the newborn foal toddled into the hollow trunk of the dying tree. For many minutes I observed as his initial investigation turned into a real dilemma for him. 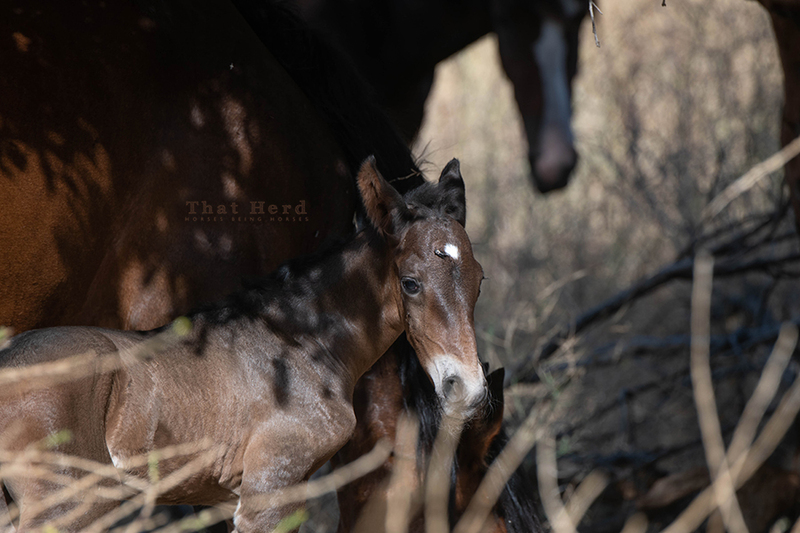 Unable to navigate his way out of the tree trunk, his mother became concerned and circled the tree over and over, encouraging her colt to come to her. 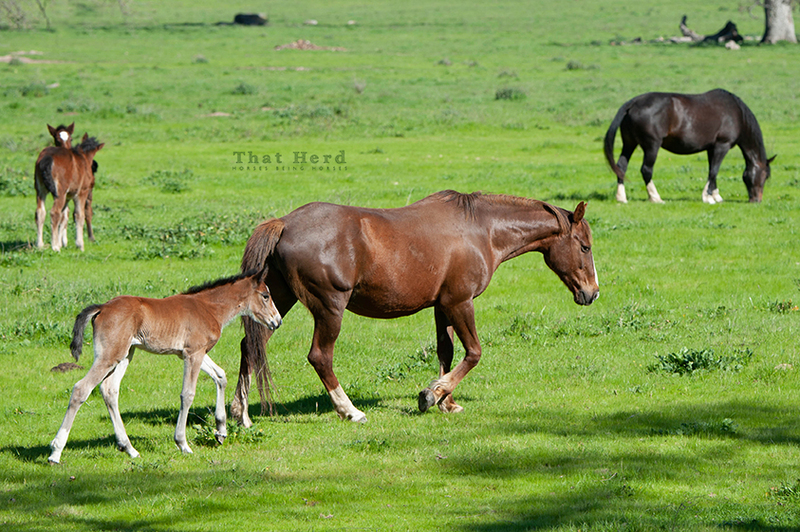 When the other horses eventually wandered away, the mother became frantic. 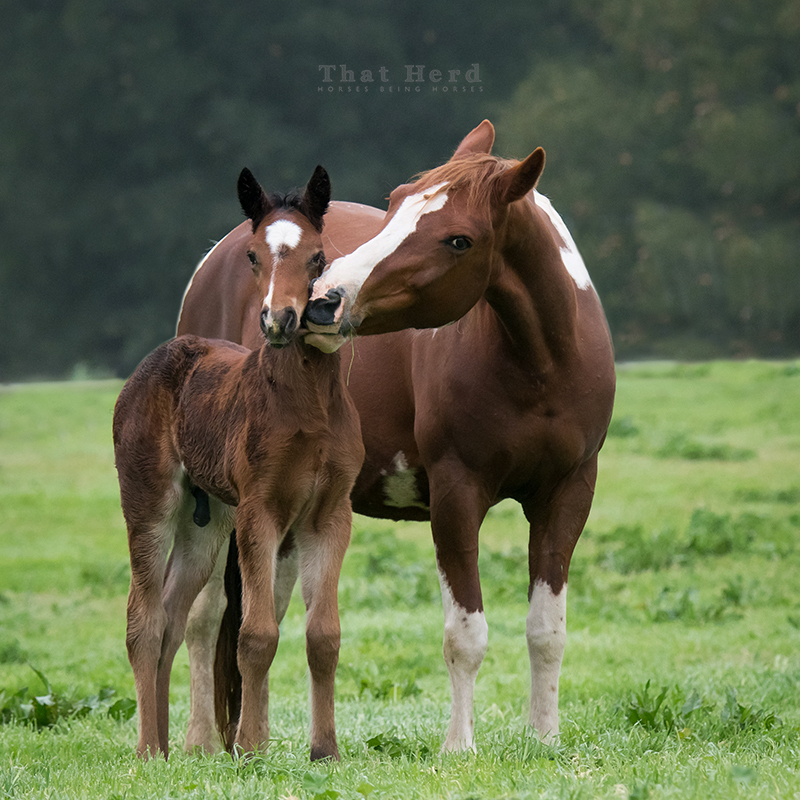 Seeing as she is a first-time mother, I also became concerned that she may pursue the other horses and leave the foal in confusion. I intervened and pulled him out of the tree. All’s well, that ends well. A positive ending overshadows any problems that precede it. 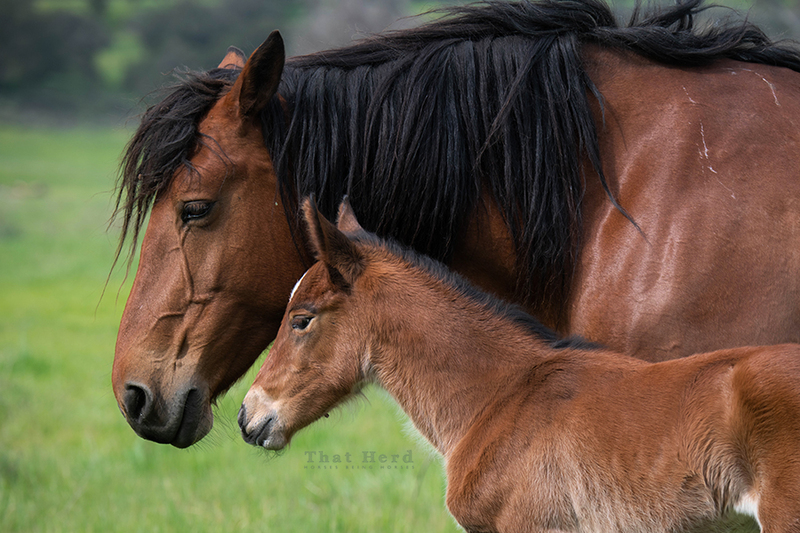 A horse fly finds an easy mark and wakes up a sleeping newborn foal. 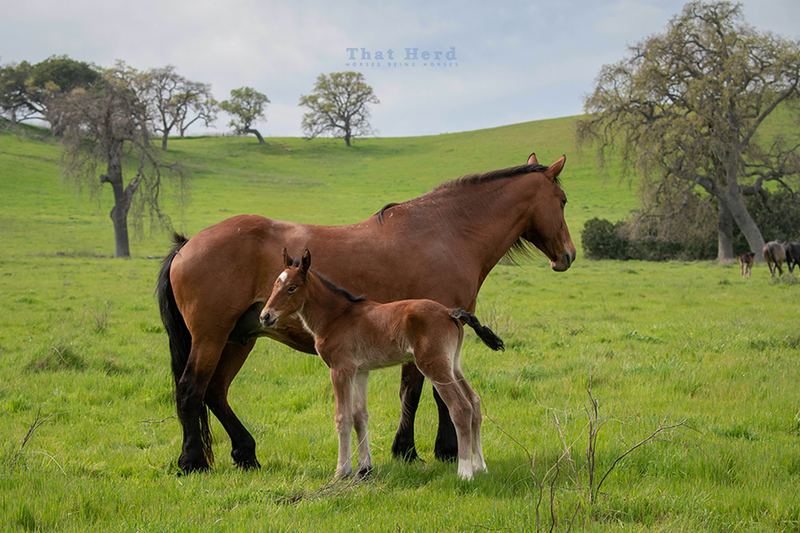 Without a long tail or life experience, this newborn become the target of a horse fly. 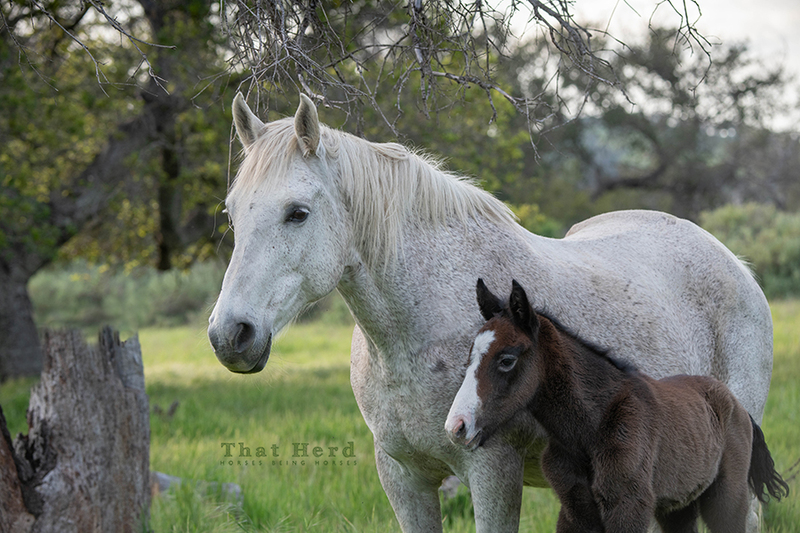 A horse fly finds every possible indefensible spot on this newborn foal. 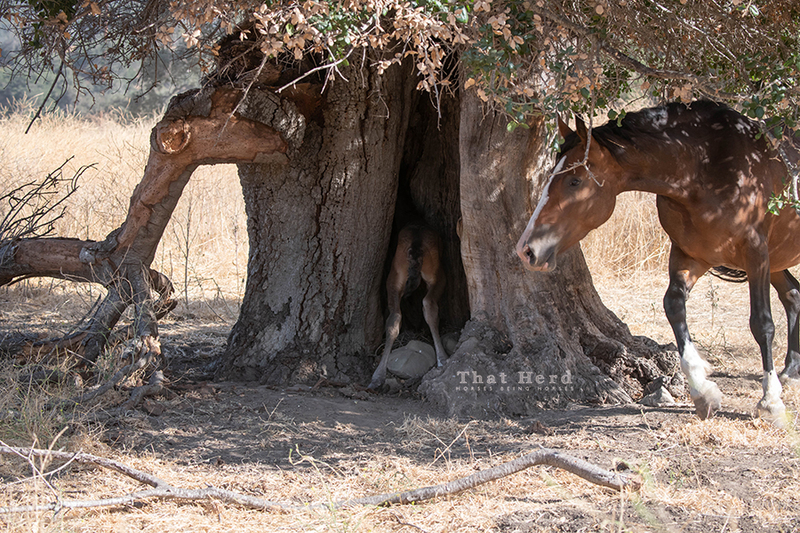 A newborn foal finds himself in a dilemma when he toddles into a hollow tree. 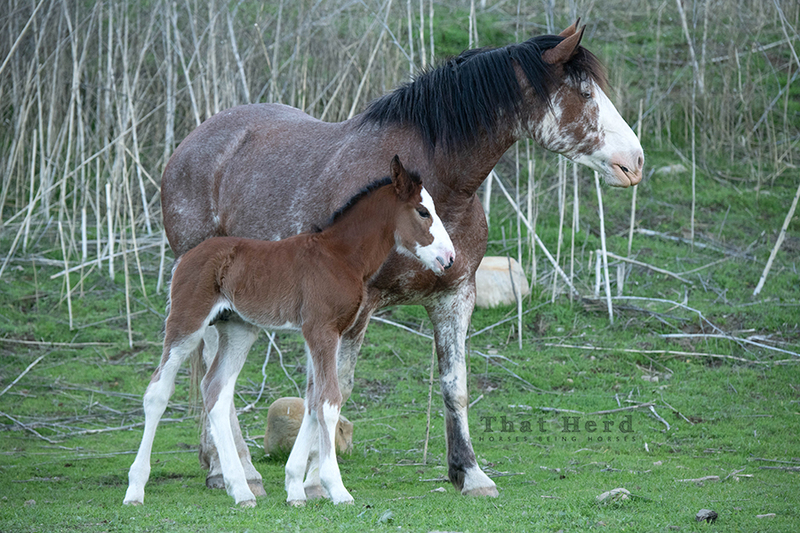 A late season birth brings new life to That Herd. Raw, uncut, no-ego, take-it-as-it-comes face of a newborn. These moments, when absolutely everything is a lesson in living, are precious. 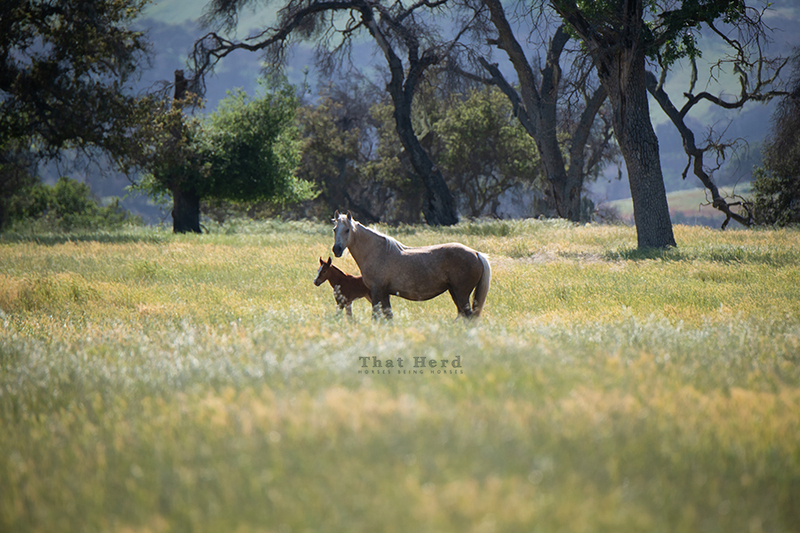 Nothing inspires thoughts of positivity and hope like a brand new life. Good luck, little guy. 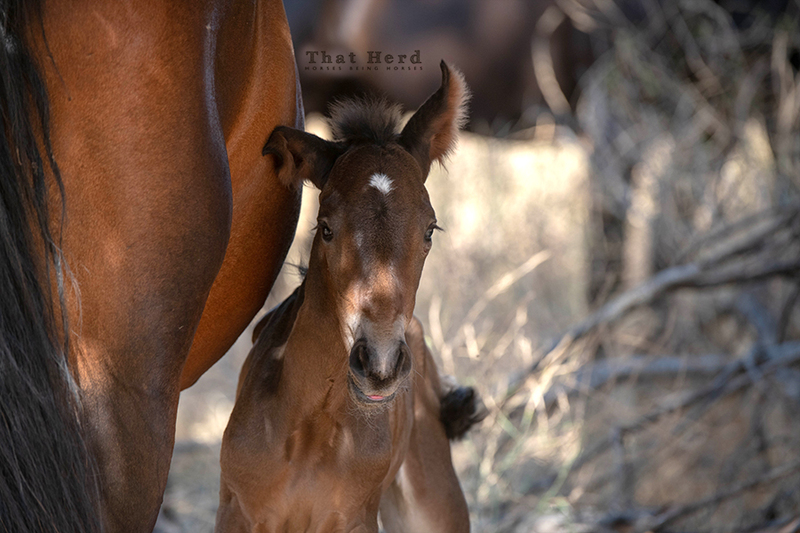 A late newborn presents an irresistible face. 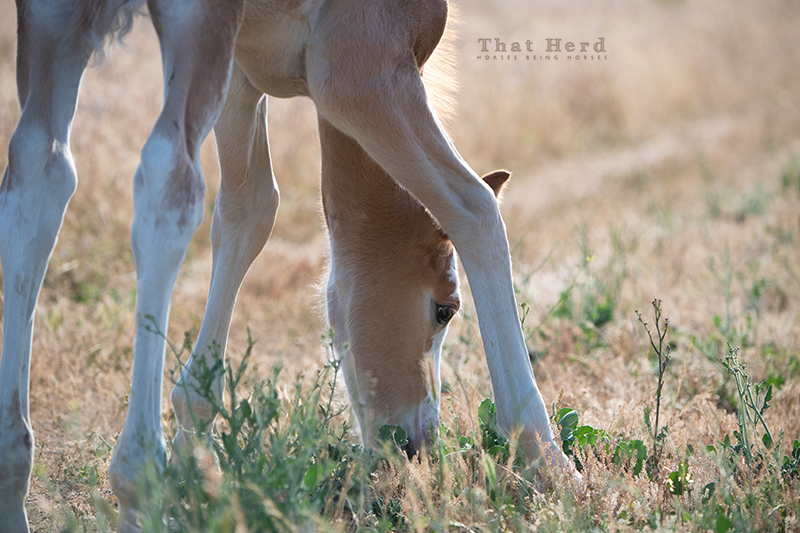 The quintessential foal pose; legs bent to ease an impossible distance from nose to ground. 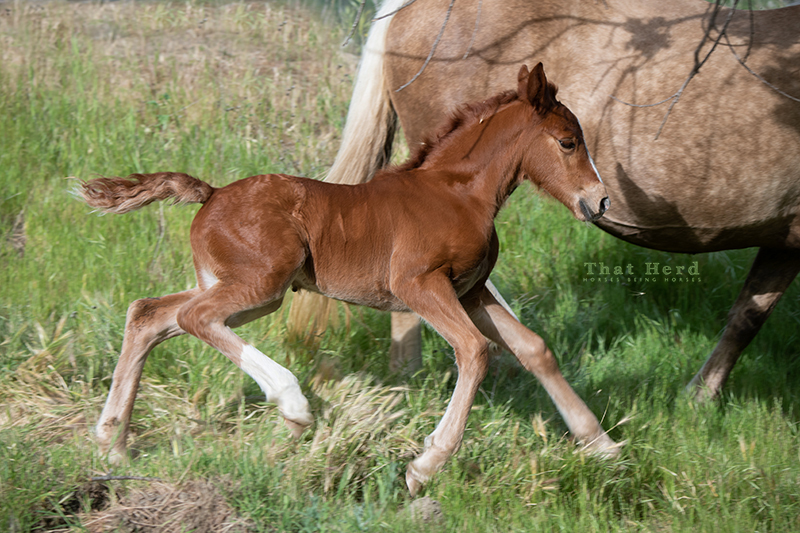 Foals are born with their disposition already developed. 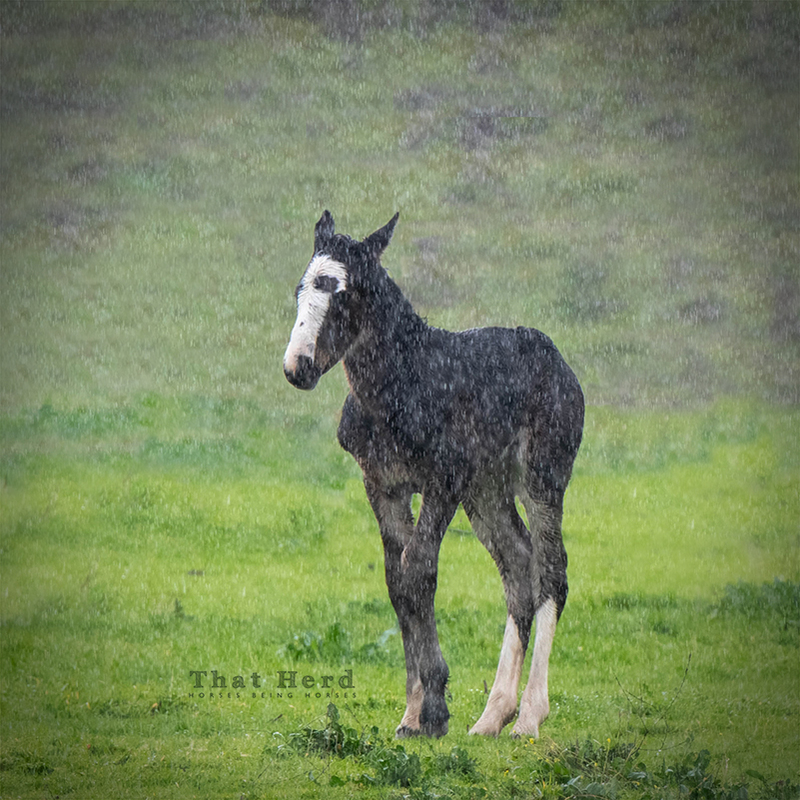 This week-old foal makes is clear he will not be intimidated. 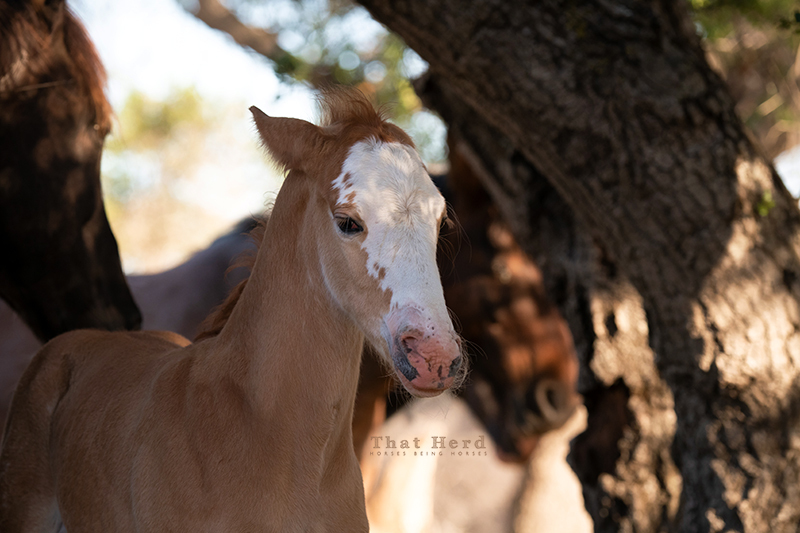 Several mares and foals were moving about under the shade of a large tree, and any horse that tried to push through this guy’s space got a side-eye-wrinkle-face with the standard head bob and pinned ear warning. This behavior is both a marvel of instinct and giggle-worthy at the shear absurdness of it. 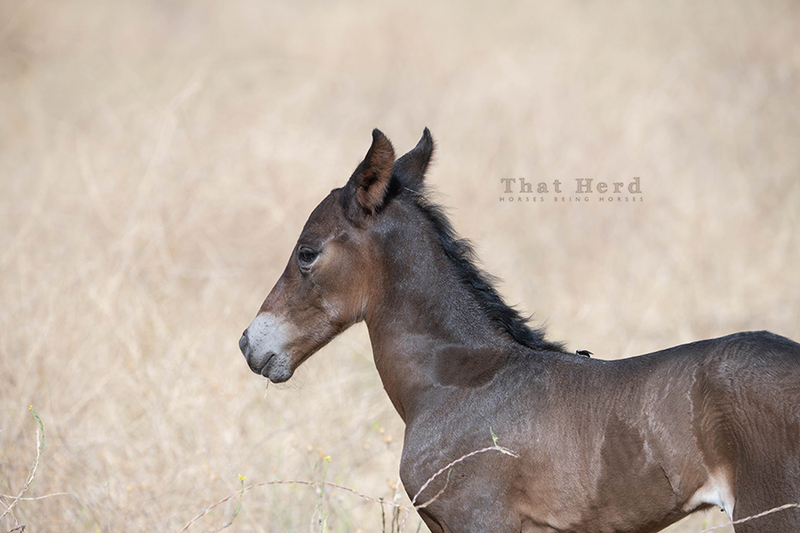 A new foal stands up for himself with a strong attitude and a sour face.